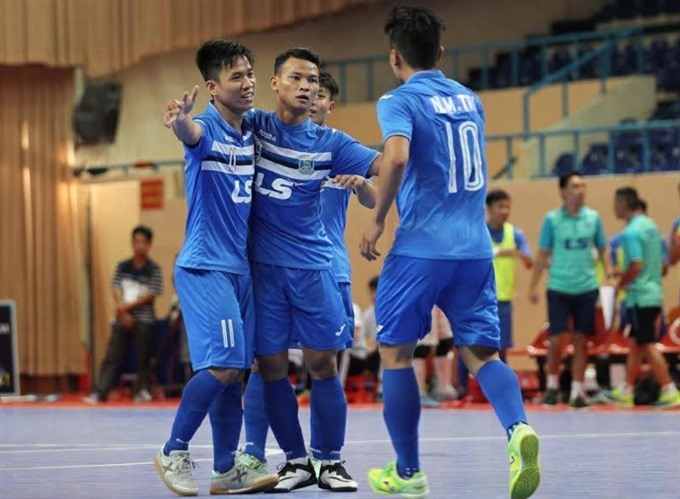 HÀ NỘI — Defending champions Thái Sơn Nam continued to dominate the National Futsal Championship with an 8-2 win over Hoàng Thư Đà Nẵng yesterday in HCM City. With better experience, staff and technique, Thái Sơn Nam pushed up their team and pressed the opposition from the beginning. They pocketed the opener after just three minutes with a left foot kick by Lê Quốc Nam. Lâm Tấn Phát made it 2-0 some minutes later, with a kick that lobbed the ball over goalkeeper Lê Xuân Trường’s head. The first period ended at 4-1, with the only goal by Hoàng Thư Đà Nẵng scored by Thái Sơn Nam’s Đỗ Xuân Du, who made his own goal. After the interval, Thái Sơn Nam was still the better team, and they netted four more goals to take their fifth win after six matches. Hoàng Thư Đà Nẵng’s second goal was in the final seconds when Trần Văn Tấn Tài heeled in at close range. Coach Nguyễn Bảo Quân said he wanted a big win so Thái Sơn Nam could create some distance from the other rivals, such as Sanna Khánh Hoà and Hải Phương Nam Phú Nhuận. Assistant coach Trần Ngọc Tú of Hoàng Thư Đà Nẵng said his team was in a difficult situation because of injuries, as the substitutes were not strong enough to take the left positions. It was their biggest loss of this year. Thái Sơn Nam led the tournament with 16 points and will play third-place Hải Phương Nam Phú Nhuận on Wednesday. Hải Phương Nam Phú Nhuận’s winning streak was ended after losing 2-3 to Tân Hiệp Hưng yesterday. Their exciting feeling did not help much in a game that their rival planned to play in defence. Each team scored one goal in the first 20 minutes. Three more goals were netted in the second period, with Hải Phương Nam Phú Nhuận going ahead after a kick by Đỗ Hoài An. But Tân Hiệp Hưng’s power-play worked well, as they came from behind to score two goals in the last five minutes, and CổTrí Kiệt grabbed a double. “We had a good match, but it is pity that we lost after having the first goal due to their power-play tactic,” said coach Nguyễn Tuấn Anh of Hải Phương Nam Phú Nhuận. “We will watch the match again and find out how we lost these two goals. We have to fix our mistakes and find the best way to resist power-plays,” he said. Tân Hiệp Hưng’s assistant coach Trương Hồng Tài said his players competed with 200 per cent of their ability. He found that Hải Phương Nam Phú Nhuận’s weak point and then applied the power-play to win, he said. It was their first win during this competition.